Collagen has become the latest buzzword in beauty. And for good reason! Collagen is the main protein in our skin, and it’s responsible for keeping it plump and youthful. While collagen is great tool for your beauty routine, it also provides out of this world benefits to your entire body. You can look for creams and serums with collagen or simply add it to your diet to get the benefits on the inside. 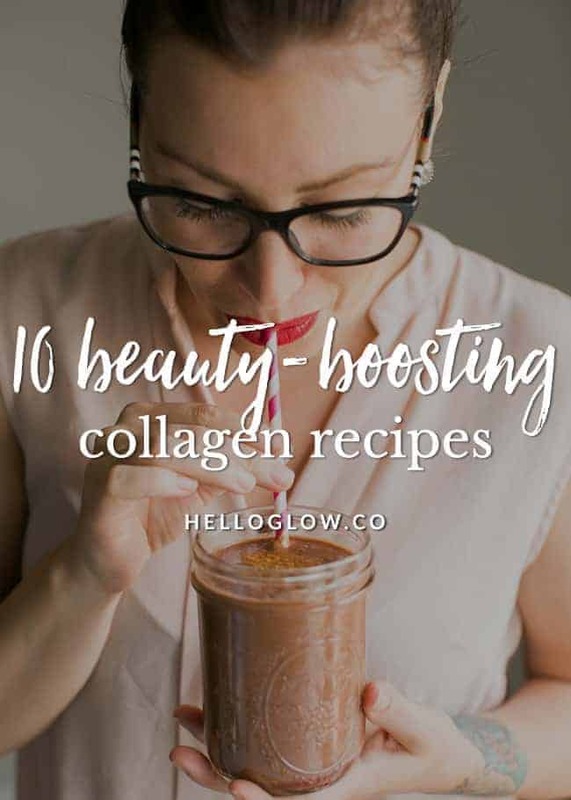 Getting enough collagen helps you avoid wrinkles, sagging skin and cellulite. It also supports shiny hair and strong nails — the beauty package! Collagen is also essential for bone, joint, and blood vessel health, and when you don’t get enough, you may experience brittle bones and achy joints. Some even say that eating more collagen can better support gut health, too. OK… so how do you exactly eat collagen? Chances are that adding collagen to your diet is a lot less expensive than department store anti-aging potions. 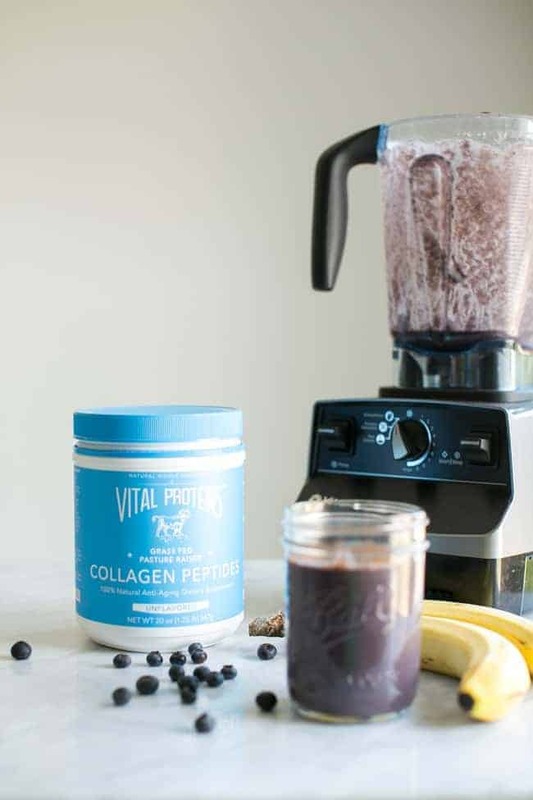 Get collagen from grass-fed, pasture-raised cows from brands like Vital Proteins, and you can add it to just about any recipe. There’s certainly a lot of us who rely on a cup or two of coffee in the morning (I’m guilty). The difference with this Frothy Butter Coffee and your normal cup from Starbucks is collagen! All you need is your normal brewed coffee, butter, coconut oil, collagen and vanilla extract. Once you have all of your ingredients, you just turn on your blender and you’re good to go. My new favorite way to start the day is with a smoothie with blended with chocolate, cherries and collagen – a recipe a straight up stole from my girl Jennifer Aniston. Whatever smoothie flavor you love, collagen peptides are a great substitute for protein powder. You’ll get 9 grams of protein per scoop with no weird flavor. If you’re looking for a dose of collagen in the morning, these Banana Chocolate Chip Pancakes from This House of Joy will hit the spot. Chocolate chips naturally belong in pancakes, in my opinion. Plus these pancakes are grain and gluten-free. I know I’m not the only one out there who can eat all the dough before making cookies. 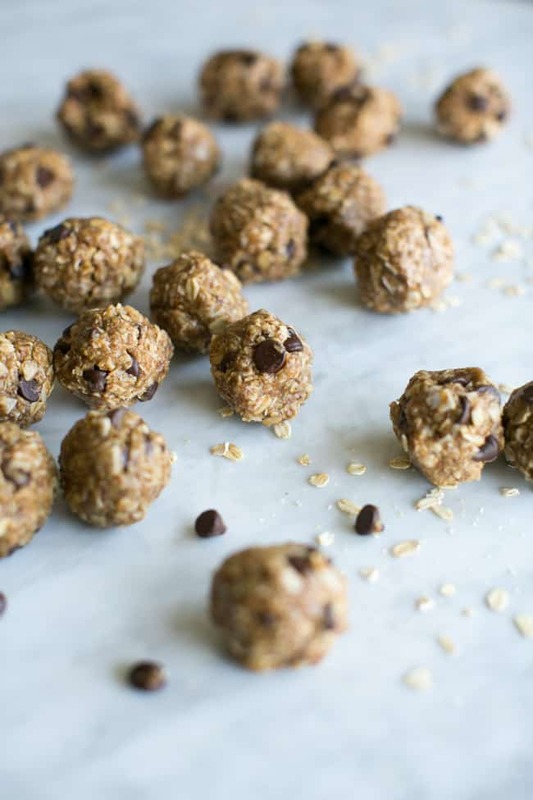 Try these egg-free No Bake Cookie Dough Bites from Beyond the Bite that sneak in collagen with coconut flakes and maple syrup for an extra unique flavor. Protein bars are great to have for those times you need a quick snack on the run. And, when they’re actually healthy, it’s even better. So many store bought protein bars actually have a lot of unnecessary ingredients and a lot of sugar, so if you can make your own, the better! Not only are these Sunbutter Chocolate Collagen Protein Bars by Cook it up Paleo loaded up with chocolate, they have sunflower seeds and coconut flakes as an added bonus. Chia pudding is one of my go-to breakfast recipes, and it’s even better when it’s turned into a parfait. This Strawberry Chia Pudding Parfait uses collagen peptides, chia seeds, coconut milk and berries for a delicious creamy texture. Chia pudding works great as a take-to-work breakfast, since you can just put it in the fridge overnight and grab it in the morning. You can easily hide collagen powder in sweet treats like pudding and ice cream, and the protein will fill you up. This banana soft serve from The Collagen Queen adds an extra indulgence with clean chocolate magic shell. Or try this Lemon Panna Cotta by Savory Lotus that shows how well coconut milk and lemon zest pair together — a match made in heaven. Even better, this recipe is dairy-free and paleo friendly, if that’s up your alley. Something chewy is what you probably expect from using collagen, so here you go! These Paleo “Candy” Sour Gummies by Bare Root Girl are great to keep around the house when you get that sweet tooth craving – and they’re perfect for kids! The recipe uses limes and blood oranges, which sounds like a delightful combo for a candy. 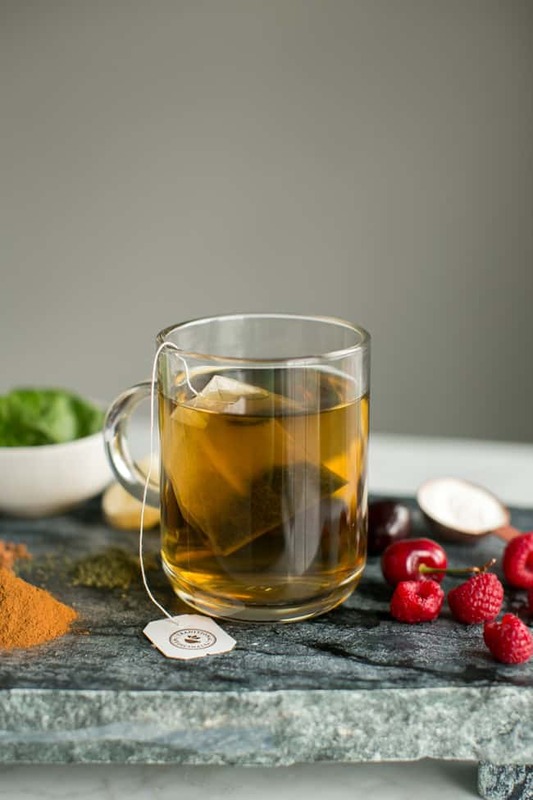 One of my goals has been to switch up my afternoon coffee for green or red raspberry tea. And adding a scoop of collagen is an easy way to add protein that helps stave off afternoon treat cravings. You can just stir the collagen into your regular brew. It dissolves easily and has no taste. Here’s a recipe for the chef who is willing to do a tad bit more work (but not much, I promise). Not only does this Chicken Zoodle Soup by Raising Generation Nourished pack a healthy dose of veggies, it actually uses bone broth as opposed to chicken stock or broth. Bone broth is an excellent source of protein and collagen, and she even includes a simple recipe to make your own if you’re really ready to get down to business. This post is sponsored by Vital Proteins. All opinions are, as always, our own. Thank you for supporting the brands that make this site possible! I’ve heard that collagen peptides were good for you but didn’t know how to incorporate it into my food. This was very helpful though I’ll skip the coffee. I love the smell but my body doesn’t like the stuff. I can’t wait to try out these 10 recipes. Is it true really falling off 250 strands on days we wash our hair? ?is it natural? A scoop of collagen powder blends easy-peasy into mashed avocado for guacamole or avocado toast.